We have scheduled a 50th Reunion Golf Outing for Memorial Day, Monday, May 25, 2015 at the Robert J. Lynch Municipal Golf Course at Putterham Meadows located at 1281 West Roxbury Parkway, Brookline, MA 02467, telephone number: 617-730-2078. We will leave Reunion headquarters at Quincy House at 6:45 AM for a 7:30 AM tee-off. We will return to Memorial Hall at Harvard by 1:00 PM for the first official Reunion event, the symposium, “The Awakening of Wisdom: How to Experience and Practice It”. Transportation will be provided to the golf course and back at no cost. The golf outing will be open to classmates and their spouses or significant others. We will have a friendly competition with prizes for low individual net score, low individual gross score and low team net scores. The designation of teams is yet to be determined, but might be something like New England vs. The Balance of the US, Eastern US vs. Western US, North US vs. South US or possibly the River Houses: Elliot, Winthrop, Leverett & Dunster vs. the Inland Houses: Kirkland, Lowell, Quincy, Adams & Radcliffe. The emphasis will be on camaraderie, fun, exercise, fresh air and enjoying a beautiful spring golf day in New England. The cost is $63.00 per person, including cart. Walkers will pay $43.00 dollars. Pull carts are available for rental for $8.00. You do not have to bring your golf clubs. Good rental clubs (Callaway or Titleist) are available at the golf course for $30.00 per person. You need only bring your golfing apparel, footwear, golf balls and enthusiasm. There is a snack bar/grill at the golf club. The Robert T. Lynch Municipal Brookline Golf Course at Putterham Meadows is a very interesting and challenging public golf course. It was designed by noted American golf architects, Wayne Stiles and John Van Kleek. They designed more than 140 courses from Maine to New Mexico, including the Split Rock and Van Cortland Park Courses in Bronx, NY, Cranwell Golf Club in Lenox, MA and the Taconic Golf Club in Williamstown, MA. Stiles & Van Kleek were contemporaries of Donald Ross (Brae Burn and Essex Country Clubs in MA), Alister McKenzie (Augusta National Golf Club) and A.W. Tillinghast (Winged Foot Country Club in Westchester, NY). They all were titans in American golf’s golden age of architecture from 1910 to the late 1930s. The Putterham Meadows Course was constructed in 1933. It has the feel of a Donald Ross course with its harmonious blending with the natural landscape, tilted greens, the occasional blind tee shot and optical illusions wherein a 350 yard par 4 hole can seem to be 500 yards away. Note, however, that Putterham Meadows is a public course and has wear and tear in a number of areas. It is not a manicured private course. However, it is a great layout which we think you will enjoy very much. Putterham Meadows also has a significant place in the history of American golf. It is built in the Putterham section of Brookline where the great Francis Ouimet was born and raised. Ouimet electrified the golfing world in 1913 when as a relatively unknown 20 year old amateur he won the US Open at the adjoining Brookline Country Club defeating the top golfers in the world including famed British professionals, Harry Vardon and Ted Ray. 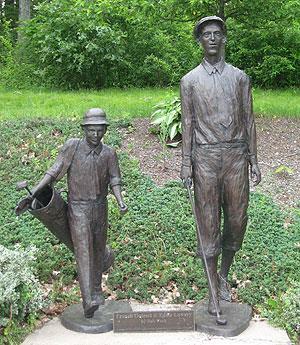 Outside of the Putterham Meadows club house there is a famous sculpture of Francis Ouimet and his ten year old caddy, Eddie Lowery, commemorating their great victory in the 1913 US Open. It was donated to the Putterham Meadows by the adjoining Brookline Country Club so it could be enjoyed by the general public. This statute of Ouimet and Eddie Lowery is an iconic image of American golf and was used by the USGA as its official logo when it celebrated its 100th Anniversary a number of years ago. We hope you will join us for a wonderful morning of golf on Memorial Day before the formal Reunion begins. This outing of golfing, camaraderie and friendly competition will be a great way to start our Reunion celebration.